Monday, March 29: New migrants at Ojibway included Eastern Towhee and Northern Flicker today (Paul Pratt) and Field Sparrow yesterday (Fred Urie). A Common Redpoll flew over the centre yesterday and a Purple Finch was seen today at Memorial Park (Fred Urie). Ten Midland Painted Turtles were sunning on logs in the creek on March 27 and the first Blanding's Turtle was recorded the same day by Mark Conlon. Silver Maple, American Elm and American Hazel are now flowering and the lawns around the nature centre are starting to green up. 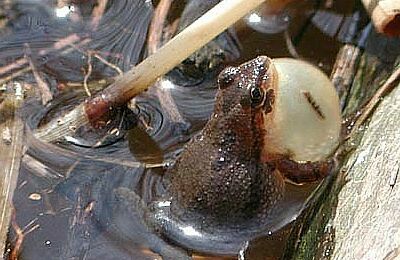 Wednesday, March 24: Chorus Frogs resumed calling yesterday after the return of warmer weather. The nature reserve next to Titcombe Park and the large pond at Spring Garden are good locations to hear calling frogs. Sunday, March 21: Eastern Phoebes appeared at Malden Park, Oakwood, Memorial Park and Brunet Park today (Fred Urie, Paul Pratt). Fred Urie also reported 14 Golden-crowned Kinglets at Brunet Park and Tufted Titmouse and Winter Wren at Oakwood Park. Wednesday, March 17: A snow storm yesterday covered the ground with up to 10 cm. of snow. American Robins and Red-winged Blackbirds are back in good numbers despite the wintery weather. Friday, March 5: Record high temperatures (+19C) today were responsible for our first Eastern Garter Snake and Western Chorus Frogs for the spring. Ice coverage on the creek is now less than 30%. Thursday, March 4: The first American Woodcock for the spring were heard calling last night. The bike path along the Titcombe Road allowance is the best place to listen for woodcock. The last of the snow cover has finally disappeared from the park and the ice is beginning to melt on the creek in front of the nature centre.